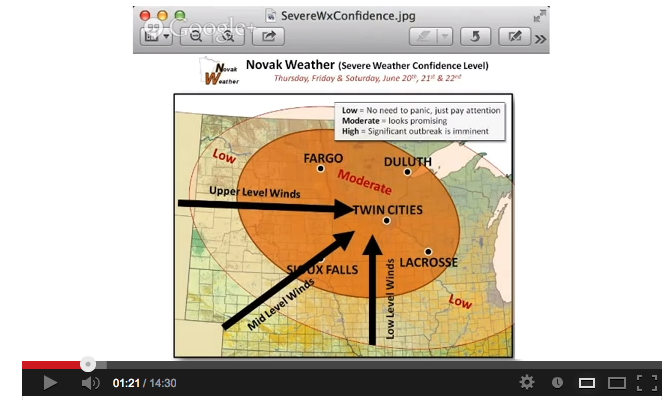 Most forecasters see the potential for big storms coming through Minnesota later tonight. Tom Novak weighs in on this possibility in our latest Google Hangout. What's an MCS you may ask? A mesoscale convective system -- some big words to explain big storms. Big t-storms blossom to the west in the Dakotas. 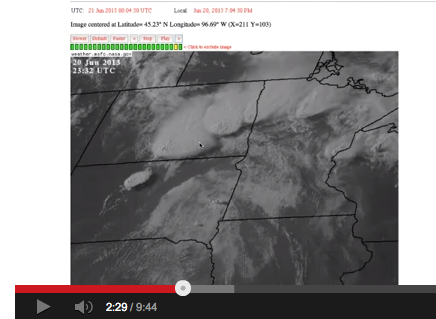 Severe Weather Outbreak in the Cards? Wednesday, 9:30 p.m. update. We have posted a video discussion of the prospects of severe weather with Tom Novak from @novakweather. Due to technical challenges, the video takes place in two segments. The first segment can be found here and the second video can be found here. Forecasters have identified the possibility of a severe weather outbreak in the Twin Cities region beginning later this week. Use this thread to provide thoughts and comments on the developing situation. Note: We plan to produce a video with Tom Novak later Wednesday night to provide some background on the situation.